Because no one seems to want to let him do his job. 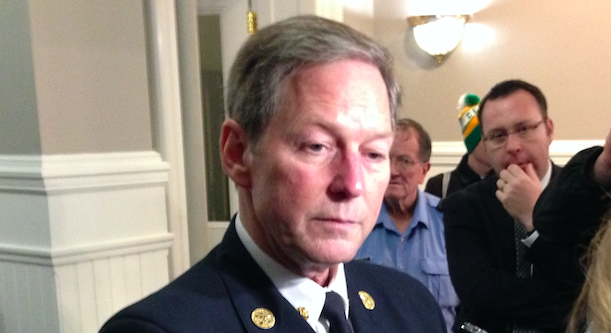 Halifax Fire and Emergency Services chief Doug Trussler. 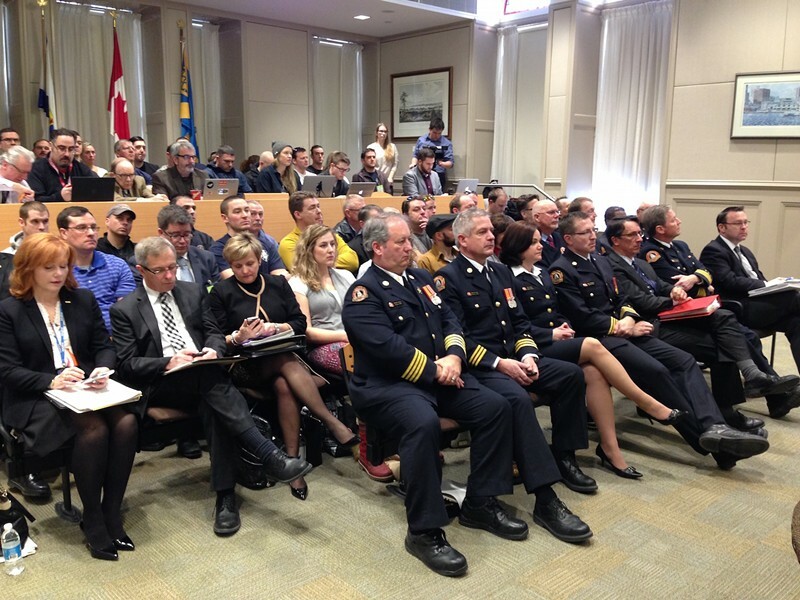 On Tuesday Halifax Regional Council debated controversial fire staffing options in front of an audience packed with reporters and firefighters. In recent weeks, many have come forward in opposition to Halifax Regional Fire and Emergency’s proposal (among other changes) to put volunteers in Dartmouth’s King Street station on nights and weekends. Bowing to that public pressure, council shot down chief Doug Trussler’s best laid plans by a vote of 11-5. We now await the cost of a new delivery model—as proposed by councillor Steve Craig—which will see dozens of new firefighters hired and likely increase taxes over the next four years. The assembled municipal employees, firefighters, reporters and citizens gathered at council to hear Trussler speak this week. There’s been some impressive vitriol spat at Trussler’s ideas over the last several weeks. Everyone from business leaders like King’s Wharf developer Francis Fares to unofficial Dartmouth mayor Joel Plaskett have come out in opposition to a staffing proposal that’s been supported by three independent studies. The firefighters’ union and its members were also against management’s plans, doubting those datasets were accurate. While some councillors praised Trussler’s efforts in what they called an impossible situation, there was little love for the fire chief from Dartmouth’s Gloria McCluskey. “This motion, in my opinion, shouldn’t even be here,” McCluskey said, suggesting that HRFE managers did “an end run” on council’s directive last year to come back with a staffing solution that would not decommission any stations. McCluskey argued that the dictionary definition of “decommission” involves withdrawing something or someone from service, which would technically include removing full-time firefighters and replacing them with volunteers. It was bizarre. Much of the public’s information about what the fire department was proposing was “distorted,” according to Bill Karsten. But the councillor still voted down the recommendations, due to public perceptions. “Quite honestly, chief, I think council has tied your hands,” said Steve Craig, before voting against the recommendations. Outhit likewise voted against the plan, even though he later told reporters the idea of council making operational decisions should have been ruled out of order. But now we’ve set a precedent on councillors deciding on municipal operations, and Outhit says it’s not going to be pretty. Trussler has repeatedly, with great emphasis, assured council and the public that his proposal would not have negatively affected response times. 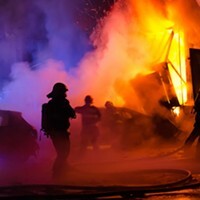 It would have redistributed firefighters to what the department felt was optimal standards for responding to the calls its receiving. It would have kept every station in HRM open, and it would have put a full complement of four firefighters on the two aerial trucks on either side of the harbour. The new plans, as proposed by Steve Craig, will have the same result but be achieved through hiring 52 firefighters and potentially cost $5.3 million over the next three years. Last summer Trussler recommended (amongst other changes) to close King Street completely. That was shot down by council due to public outcry. So he came back with a new plan, to meet service standards without closing any stations (even if they were redundant). To stay cost-neutral, that meant using volunteers. Everyone hated that idea. So now council has done what perhaps it should have done years ago and asked for a staff report on the cost to invest in more firefighters. Whether they’ll approve price tag will be discussed when the report returns in a couple of weeks. That could all be for naught, however, as the municipality is currently in the process of hiring an outside consultant to review HRFE’s service standards. That report will come back to council in March, and could potentially find staffing levels inadequate, or some firefighter positions redundant. We won’t know until we see it. Which means come March we’ll probably be right back where we started; discussing where’s best to deploy firefighters. Earlier this week I asked Steve Craig on Twitter if it would be better to wait until this review came back before debating Trussler’s plans. He suggested it didn’t really matter. @RWJBoon @matlantivex No. Always many moving parts, and staffing issues. But Craig’s fellow councillor Tim Outhit disagreed. Outhit told reporters earlier this week that he had sympathy for waiting to make a decision until after the standards review was delivered. Despite the public outcry, Trussler was composed and professional while on the hot seat. He maintained that his trust in council hadn’t been shaken by these events. In fact, Trussler said he saw a lot of positives with how things shook out—including that HRM will now presumably end up with the four-man aerial crews on either side of the harbour like he always wanted. The rest, was just politics.